Have you ever heard of Pastafarianism? 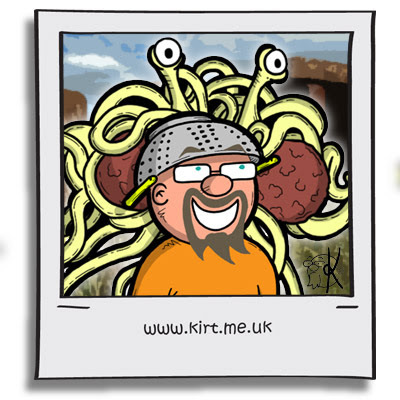 I had but I have to say I'd never been to a Pastafarian wedding until last weekend. 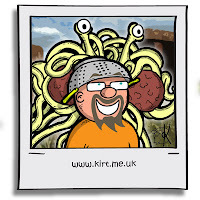 If you've never heard of Pastafarianism then it refers to the Church of the Flying Spaghetti Monster. No it's not a spoof religion (any more than Scientology) and if you're interested look them up. The actual legal bit was done before the noodley bit but together with all the pirates (I did tell you to do your research) it was a bizarre event held outdoors at a nature reserve built on a former steelworks (called Steelhenge because of the layout of metal girders and plinths). The reception was held in a pub in town with live music and great food including a hog roast, wood fired pizzas (not for me as most know I don't like cheese) and dripping butties. So maybe this is how weddings should be? There is a serious aspect to it but there's no reason why you can't have some fun along the way. And for me? I was honoured to be part of it.